Students explore our world through life science, earth science, and physical science. At the core of third grade life are daily prayer experiences and learning of the faith. The third grade classroom religion focus is on the beliefs of the Catholic Church, the Trinity, and the Liturgical Calendar. Within the school year are special opportunities including the Peacemaker Program and the Caring Retreat Day with our school counselor. Third graders serve school, parish, and community. We are also closely connected to St. Patrick’s sister parish school in Bogotá, Columbia. 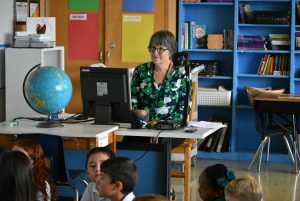 St. Patrick Specialists teach enrichment classes to 3rd graders that include art, music, library, computers and physical education. See Intermediate Enrichment Classes to learn more.